FPD-TT2 Full color die cut training photo-target. Designed to fit the upper 3/4ths of: Plastic "E" Targets/Bobbers, Chipboard/Fiberboard "E" Targets/Bobbers, Cardboard Bobber Targets/Backers. 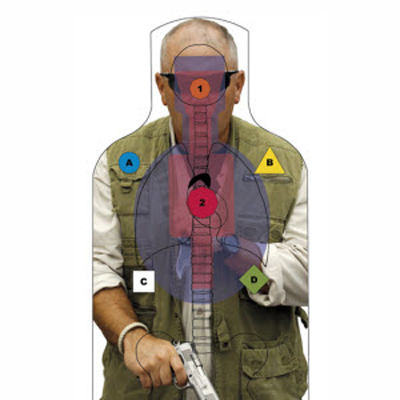 Features critical, center mass & anatomy zones plus command training shapes. Designed for the Franklin, TN Police Department. Size: 19.5" x 35"